What's the Difference Between a Tablet and a Panel PC? With the growing popularity of tablet computing we’ve worked with many clients who are considering a tablet PC for their industrial application or, more commonly, coming to us to replace their existing tablet infrastructure with proper industrial computers. The fact is that while consumer-grade tablets certainly offer a number of intriguing features, in most instances the benefits often fall short of the potential challenges, especially when it comes to implementing tablets in an industrial setting. Of course, that’s not to say that tablets are never the right fit, but let’s look at a few of the important considerations when choosing between a tablet and an industrial computer and the ways in which tablet PCs differ from Panel PCs. With the portability of tablets comes the need for charging. While industrial Panel PCs are hardwired for power, tablet computers require a separate charging solution of some kind. 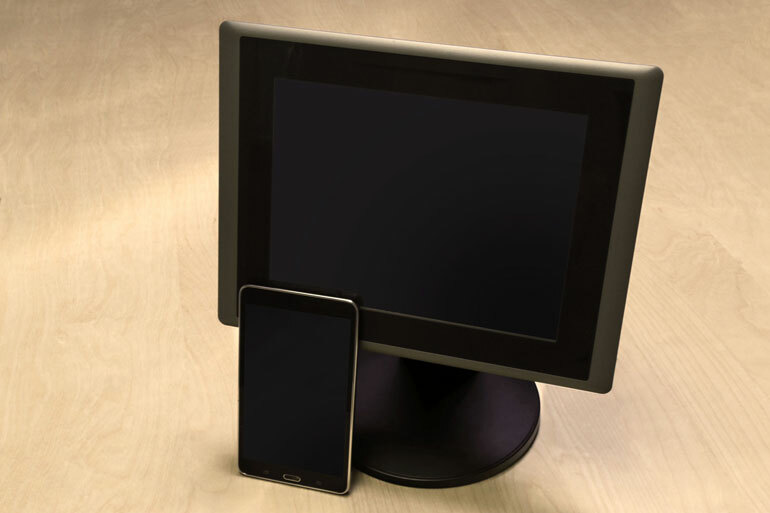 When purchasing tablets for an industrial application it’s important to consider the need to install charging stations and have protocols in place to ensure regular charging to prevent dead batteries which can result in wasted operator time or even data corruption. Reliable networking is a must-have in the majority of modern business applications, but tablets largely rely exclusively on WiFi since a standard LAN port connection simply isn’t feasible. While WiFi may be adequate for many applications, if networking performance is a concern a wired LAN connection is always preferable. In general the lack of I/O on tablets is often a non-starter for users who need to connect to multiple devices or equipment. While external hubs can add some functionality, their additional cost and overall reliability should be considered as well. System longevity is obviously important in any PC purchase. You’ll want to make sure that the warranty of any hardware purchase is factored into your budget. Due to the higher risk of damage, combined with consumer-grade parts and construction, extended warranties for tablet computers frequently come with a heavy premium. Industrial Panel PC systems on the other hand often include a more inclusive and/or longer standard warranty. Along the same lines as potential support concerns, downtime is something that no business wants to deal with. Research into the cost of downtime has found that the average manufacturer can lose tens of thousands of dollars as a result of even a single hour of production downtime. Downtime cost is an important consideration for any business, so be sure to think about what impact system failures or hardware related downtime could have on your bottom line. Do you have redundant hardware in place? How long will it take to replace the system? Obviously, the best way to prevent downtime is with reliable hardware that won’t fail in the first place so, regardless of the solution you choose, be sure you can count on it to operate reliably. In general, consumer hardware has a limited expected lifecycle, often somewhere between 1 and 3 years. With the constantly evolving state of consumer PC components, this makes good business sense for consumer PC manufacturers, but is problematic should you need to replace or repair a system a few years after purchase. Industrial PCs on the other hand often feature lifecycles of 5-7 years, allowing you to standardize on a platform well into the foreseeable future. If you expect your business to grow, or suspect that you’ll need additional hardware down the road, standardizing on a long lifecycle platform can save you the headache of having to start from scratch prototyping on a new system or re-certifying it for use in your application. Learn more about long lifecycle computing here. As mentioned, consumer hardware is seldom designed to stand up to the day in and day out abuse of many industrial applications, and failures are virtually inevitable. When budgeting for your project be sure to consider how many on-hand replacement systems you may need. Utilizing an industrial PC solution may allow you to stock fewer replacements, saving you money in the long run. 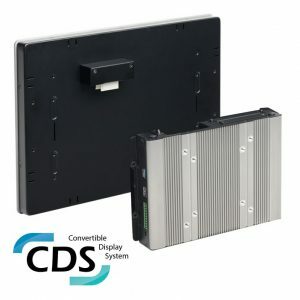 Also, with the modularity of industrial Panel PCs like the Cincoze Crystal series, it’s possible to stock replacements of both the display and PC module, allowing you to swap out only the part that requires service. Of course, every hardware installation is unique, and a tablet solution may be a viable option for your project, but it’s important to understand all the variables at play. If you need help deciding on the right hardware option our Solution Specialists can help you get started. Email info@logicsupply.com or call 802-861-2300. The Emergence of ARM: Why Embux, Why Now?